Some words can't be easily translated into English. 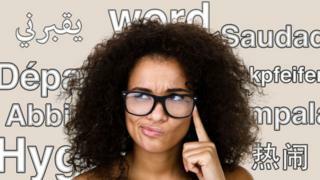 How many of these untranslatable words do you know? In Danish if someone describes something as hygge, they mean it feels...? In German, someone with backpfeifengesicht is annoying because they have...? If someone from Portugal talks about saudade, what emotion are they describing? In Italian you might describe yourself as abbiocco after a meal, meaning you are...? The Arabic expression "Ya'aburnee" has a more positive meaning than it seems. Can you pick the correct translation and guess the meaning behind it? This Spanish word describes something good tipping into something bad. But does it mean...? Which of these feelings of dislocation is described by the French word dépaysé? Which is the best description of the Mandarin phrase Rè Nao? Maybe you've picked up a couple of words that you could drop into conversation? Impressive. Either you speak several languages, you collect unusual words or you're just plain lucky. If you can't see the quiz above tap this link. Video Are modern foreign language lessons on the slide?